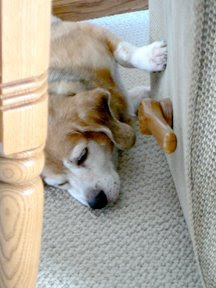 My parent’s overweight, elderly beagle--Clyde, who was supposed to have a Bonnie beagle sister, but proved so stubborn and unruly that he never gained a partner in crime--has been put on a strict allergy diet because for more than a year his fur has fallen out in clumps, he smells like a gym shoe no matter how often they bathe him, and he has horrific scabs on his belly and paws. In retaliation he has (in order of appearance): 1) began barking at them loudly when they’re eating dinner; 2) pooped on the living room floor, while my dad was watching; 3) gone rifling through my mom’s purse, scrounging for anything remotely edible (read: her lipstick); 4) refused to eat ANYTHING. Period. For up to 48 hours; 5) ripped a hole in the guest bedroom’s new wood-and-canvas laundry basket. The world would be a scary place if everyone actually did what they felt like doing while dieting.